I've had the best week creating!! Not that I've made anything spectacular... I've just been able to cross some much needed creating off my list of things to do. The first is the set of camping invites I've needed to complete. We are hosting a campout for all of our family and friends that live across the state from us... in August- I really want the invites to go out by the end of June so that everyone that wants to come has time to plan/ take time off work if needed/ etc. Since I needed to make 17 of them- and they are going through the mail- I wanted them to be simple (besides- over half the people receiving them wouldn't realize how much time I spent on them anyway!!) Since I was on the scoring kick over the weekend I kept those supplies out for a quick and simple way to make the cards look good without spending lots of time. This stamp set is one I've been wanting ever since I joined a consultant swap last summer. One of the cards I received was similar to this one with different papers, colors etc. It used the "Sleep Over" stamp instead of the "Sleeping under the stars" - It was PERFECT for a little girls sleepover party!! There's also a stamp of a little boy in a sleeping bag- so it's not specific to girls. The next thing on my agenda this week was to prep a new project kit for my customers for July. I have had a Free Spirit paper pack in my scrap area since it first came out last year. I LOVED this paper but just wasn't sure what the heck to do with it!! I decided to make it my mission to use that paper in my July kit. At first... I thought of a vacation layout- maybe with a Road Trip theme... but then when I started cleaning up my original mess from making the Camping invites...it hit me!! A camping layout would be PERFECT!! So- here it is. The tent on the page above is paper pieced from some of the designer paper in the pack... the tent was stamped on both papers and pieced together... the tent "stakes" are antique copper brads. Hope you like it!! I'll be back this weekend with more! I love the camping stuff! Shelly would love it, maybe I should get it for her!! Can I come camping too? yes!! Come camping- it'll be fun :) Too bad you'd have to fly back from England to make it!! 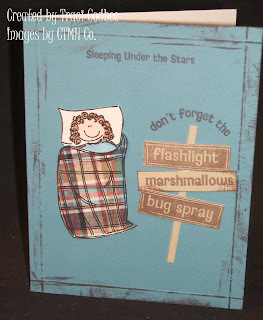 Fun camping projects - I especially love the patterned sleeping bag - too cute! TFS - and have a great weekend, I think we might be going camping, too!